Turn-based strategy titles that are based on the First World War aren’t exactly known for their accessibility, especially when there are hexes involved, but Spirit of War manages to buck this trend. 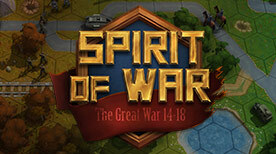 It has a wealth of units, plenty of maps and the skirmishes are quite addictive. Thanks to the lengthy solo campaign as well as the inclusion of hotseat multiplayer the game definitely provides value for money. There are a couple of niggles that prevent it from scoring higher, but overall I really enjoyed this title. Gameplay: A nice selection of different units and gameplay that is very accessible to newcomers. Graphics: Nothing too extravagant, but still has plenty of neat touches. Sound: Unobtrusive music and decent sound effects.